Most Cuban-Americans living in Miami want an end to the US embargo against Cuba, a new poll suggests. With 55% of those interviewed opposing the embargo, the poll result marks a major shift of opinion among Miami's Cuban-Americans, researchers said. Some two-thirds of respondents said they wanted travel restrictions lifted. The poll, conducted by the Brookings Institution and Florida International University, interviewed 800 people and had a margin of error of 3.6%. 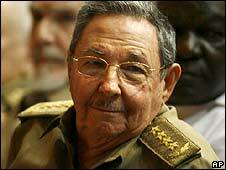 Cuba has survived more than four decades of US sanctions targeting the regime led by Fidel Castro and, since February, by his brother Raul. Most of the poll respondents voted against Barack Obama, who said before winning US elections in November that he would favour direct talks with Cuba's leader. Mr Obama also said that he would lift restrictions on family travel and remittances to Cuba but maintain the US trade embargo. At least 65% of those questioned said they favoured dropping restrictions on money transfers and travel, and re-establishing dialogue and diplomatic relations. The poll result reflects a generational rift, and the increasing number of Cubans who came to the US after 1980, in particular after 1998, researchers said.